From the March-May 2009 edition of ¡La Verdad! Exactly 10 years ago Unión del Barrio published this article in the March-May 2009 edition of our newspaper ¡LA VERDAD!. 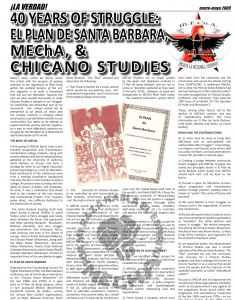 Though we are currently developing an organizational statement to address the March 31, 2019 name change of MEChA, we felt there was clear value in re-publishing this article from 2009 to help inform our communities about our historical perspective on MEChA, El Plan de Santa Barbara, and Chicana/o Studies. Our updated 2019 statement will be available as soon as possible. Editor’s Note [from 2009]: Unión del Barrio writes this article with the purpose of seeking solutions to our oppression as Raza living within the political borders of the U.S. Our objective is to build a movement that will win our liberation. Towards this end, we have worked incessantly to make Chicano Studies a weapon in our struggle: an intellectual and theoretical arm of our movement. Our critique should not be interpreted as an attack on those who are actively involved in bringing about social justice and self-determination to our communities, but rather as an attempt to explain both the positive and the negative, as a way to more effectively advance our struggle for the liberation of La Raza and all oppressed people of the world. In the spring of 1969 (in April), close to one hundred progressive and revolutionary-minded Raza college students, along with some professors and barrio-based activists, gathered at the University of California Santa Barbara to discuss and form a strategy by which to use higher education (university/college) as a tool for liberation. Most participants of the conference were from a working class/barrio background and were the first in their families to attend college. All present were bursting with the ideals of justice, freedom, and revolution. To some, it was a conference that would lead to the creation of the new human that Comandante Ernesto “Che” Guevara spoke about, one selflessly dedicated to the betterment of society. The Santa Barbara meeting itself took place during a period (1960s) in world history when a fierce struggle was taking place between the forces and oppression and those wanting liberation. Revolution, National Liberation, and class struggle was everywhere: Asia (Vietnam), Africa, Latin America, and even in the streets of Europe. Here in Aztlán (Occupied México), the Chicano Power Movement, along with the Black Power Movement, American Indian Movement, Puerto Rican National Liberation Movement, and the Asian/Pacific Islander Liberation Movement, formed an important front of this worldwide struggle. Organized by the Chicano Coordinating Council on Higher Education (CCHE), the Santa Barbara conference was of tremendous importance to the “Chicano Power Movement” (of the late 1960s and 1970s) as it gave birth to El Plan de Santa Barbara, which in turn produced MEChA (Movimiento Estudiantil Chicano de Aztlán) –uniting the various Raza student organizations, such as Mayo (Mexican American Youth Organization, UMAS (United Mexican American Students, MASC (Mexican American Student Confederation), into one national organization. The “Plan,” as it became known to most activists, also served as a catalyst for moving forward the establishment of Chicano Studies at colleges and universities, and many high schools throughout Occupied America (or what most call the United States). That Chicano Studies be a social science which would be pro-working class, anti-colonial/anti-imperialist, and in the service of the Mexican/Raza community. The necessity for Chicano Studies to be controlled by and accountable to, Raza students, community, and faculty –not the Anglo-colonial administration. MEChA would be the primary entity responsible for ensuring that professors/instructors and administrators of the Chicano Studies Programs and Departments not sell out to the institution or elitism of the academy (bourgeois intellectualism). Literally hundreds of MEChA Chapters were established at universities, colleges, high schools, and even in some middle schools. Since its formation in 1969, MEChA has engaged in struggles that have led to the creation of Chicano Studies (or Raza Studies) departments, programs, or courses; it has been responsible for ending violence and overt racism directed at Mexicano/Latino students; and has united with African, Pilipino, Pacific Islanders, Asians, other Raza, and progressive whites, to fight against all forms of discrimination on campus and in the community. Affirmative action, admission-recruitment and financial aid programs, were the results of battles waged by MEChA. Most, if not all, Latino/Raza working in the field of education (professors, teachers, counselors, instructional aides, etc.) would not have a job if it were not for the activism and presence of MEChA on their campus. MEChA has also produced a significant number of Raza community and political leaders. In fact, most Unión del Barrio members at one time were “Mechistas”. MEChA’s history of activism has been so extensive, that it would take several books to document the important role it has played in the advancement of Raza self-determination. While some MEChA chapters continue to be in the forefront of the struggle for social justice, today, forty years after its founding in 1969, we find that most MEChA chapters are no longer guided by the goals and objectives outlined in El Plan de Santa Barbara, and are not as active or liberation-centered as they were in the early 1970s. However, as weak and disorganized as MEChA finds itself today, the capitalist-colonial system which rules over the United States (and most of the world) is terrified of MEChA; it fears the revolutionary potential of Mexican/Raza youth. This is why the system is engaged in ongoing attempts (through white supremacist groups, media, vendidos, right-wing academics, etc.) to neutralize and destroy the few MEChA chapters that do exist. The question before us is “what caused the general decline of MEChA activism and its abandonment of revolutionary politics, and what must be done to bring back Mechistas into an anti-capitalist and pro national liberation struggle?” Unión del Barrio has written and commented extensively on this particular question. MEChA, along with other movement organizations was a target for destruction/neutralization by the United States government’s COINTELPRO (Counter Intelligence Program). A police program that physically and psychologically attacked activist –destroying lives and organizations. There existed a situation where most activists lacked political maturity and organizational discipline, which led to many “splits” and “internal conflicts” within MEChA and other movement organizations. These internal struggles weakened all movement organizations, including MEChA, leaving our movement easy prey for COINTELPRO. Generally speaking, in most (not all cases), Chicano Studies professors and academicians did not provide adequate guidance to form a strong base upon which to build the historical links and practical connections with the few remaining community militant organizations, thus denying students the opportunity to learn both from the classroom and the community, and survive the attacks coming from COINTELPRO. A weakened MEChA, led to what the Plan de Santa Barbarahad warned: selling out to the institution and/or the “petty bourgeoisism” of Chicano Studies professors and instructors. [See June-Oct 1997 issue of La Verdad “On The Question Of Youth and Revolution”]. Creating a bridge between community based struggles and MEChA; bringing into reality the principles found in El Plan de Santa Barbarawhich stated that MEChA should work with, and be loyal to the barrio. Provide a space for Mechistas to learn about progressive and revolutionary politics through practice; creating what is known as “praxis” (the unity of theory and practice). We assist MEChA in their struggles on campus and in the organization of events and conferences. We also attempt to inform students not to see community/barrio-based organizations as “outsiders”, but rather brothers and sisters in struggle. We remind everyone, that during the Chicano Power Movement, Mechistas were also Brown Berets, La Raza Unida Party members, and organizers for the United Farmworkers Union. As we explained earlier, the advancement of Chicano Studies was also a central objective of the Plan de Santa Barbara. The “Plan” provided not only the curriculum and structure for a Chicano Studies program, but also a strategy with tactics on how to maintain it as a science that would serve the people and not the interests of the capitalist-colonialist so-called “educational system”. But just as MEChA and all progressive and revolutionary Raza organizations had fallen victim to the government’s war against all the progressive and revolutionary forces found within the movement of the late 1960s and early 1970s – so too did Chicano Studies. By the 1980s, most Chicano Studies courses had become “mainstream” – a part of the colonial mis-education system – and an “activist Chicano Studies professor” became a rarity. Today, the situation continues to worsen. In a recent article, we explained that one of the reasons for the lack of activism found within Chicano Studies classes and programs was that “…the ‘pigs’, or capitalist establishment, have done everything they can to ‘neutralize’ activist scholars and reward those who “play by the rules’ of the state. Academics [professors, teachers, etc.] who are of no threat to the system are retained, or the doors of the ‘Ivory Tower’ [the university] are opened to them –those who don’t, soon find themselves in trouble.” [See, “Chicano Studies, Political Immaturity, and The Inability To Exercise Power”, Guerrillero/a de La Pluma, Journal of the Raza Press and Media Association, Summer 2009]. Chicano Studies must be both a scholarly and activist science. Those who are not active in community struggles, must either voluntarily leave or be forced to leave. Chicano studies must be both investigative/research and solution oriented. It must, as the Plan de Santa Barbaracalled for, postulate an anti-capitalist/anti-colonialist position. Chicano Studies must serve the community and not the academy or individuals. We whole-heartedly uphold the principle written in El Plan de Santa Barbarathat explains that its better to have no Chicano Studies at all, than to have one that is controlled by the system. The reason for this position is that Chicano Studies that are controlled by the system serve to distort our history, alter the content and character of “La Lucha” to be legitimized by the institutions of the oppressor. 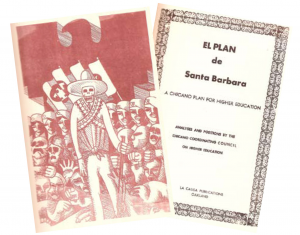 Since its founding in 1981, Unión del Barrio has worked hard to re-direct Chicano Studies to its original mission as called forth by El Plan de Santa Barbara. In the past, we have developed strong links between Chicano Studies instructors/professors and our organization. We have implemented Raza/Chicano Studies classes in community centers and as after school programs. Some of our members have taught and continue to teach Raza/Chicano Studies at the middle and high school level, as well as at the university. We have organized Chicano Studies conferences and, when not denied the opportunity, have facilitated workshops at the National Association for Chicana and Chicano Studies (NACCS) conferences. As a way of advancing the science of Chicano Studies, Unión del Barrio published a book titled Education, Chicano Studies, and Raza Liberationin 1993. As one inheritor of the past and as an organization with a long legacy of struggle within the question of education, it is Unión del Barrio’s duty to struggle for a revolutionary, critical pedagogy-based Chicano Studies. Through mass based groups such as the Association of Raza Educators (ARE), Raza Press and Media Association (RPMA), MEChA, and our participation in the National Association for Chicana and Chicano Studies (NACCS), we will continue to make efforts towards once again making Chicano Studies a science in the service of the people. This entry was posted in 2019, Analysis, Analysis, Barrio Youth News & Events, Higher Education News & Events, History, History, K-12 News & Events, Los Angeles News & Events, Organizational Updates, Self-Determination. Bookmark the permalink.